TotallyYourType: Call for help from the Typosphere! Call for help from the Typosphere! It is great that some of your machines will be used in a movie! I do not, unfortunately, have a Stenograph, but I am sure someone out there does and would be more than happy to have it appear on film. I have seen one of those Underwood Touchmaster's at a local antique mall. It has been there for a while now, but I have no plans on buying it. I think it is $65, or around there. Seems to work alright, but I just don't like that it is plastic. Next time I go, I should put a piece of paper in and have a try at it. My TM5 isn't plastic. Mine was $140... which I know is a lot, but it is perfect and "untitled". I hear ya; a machine's worth is equal to or exceeds how much you really want it! I'm pretty certain the one I saw was plastic, although it has been a month or two. It has been there for a while, so I know I checked it out a couple of times. I don't know much about these very recent (Olivetti) Underwood standards. It is incredibly complex, and if your Ambassador is not a great fit for you then I might assume this wouldn't be either. It doesn't work for me. I just like it because it is brand new and it was one of my first standard machines. That underwood looks like it could take on the world! Not quite my style of machine, but quite interesting none the less. It seems like you have an amazing clutter of machines there. Just a broken Oliver, a naked machine that is not mine, and something totally and unbelievably awesome I shall show you later after I do some more work on it. I have an old one, but how would I get it there? I have two stenotypes also that are more modern. Contact me via manual entry. I know that here in Phoenix the Touchmaster Five is hard to find. During the 1980s the Mexican Government bought up large numbers of old-stock from dealers in the southwest. They were still used by many ministries south of the border and I guess they wanted to have plenty of them on-hand. There was also a lucrative trade here restoring Underwood typewriters for export to Mexico. That's pretty interesting. I think the TM5 is a slightly difficult machine to find anywhere; I have only ever seen a few for sale (and really don't need another). It is an impressive machine though, especially when placed next to an Underwood 5, there are a lot of differences sure but the basic layout and main components just didn't change. That is an imposing machine! Isn't it funny that some machines you seem to mesh with better than others? I wish I did have a steno to loan you; I've been wanting to add one to my collection for some time now. Best of luck! 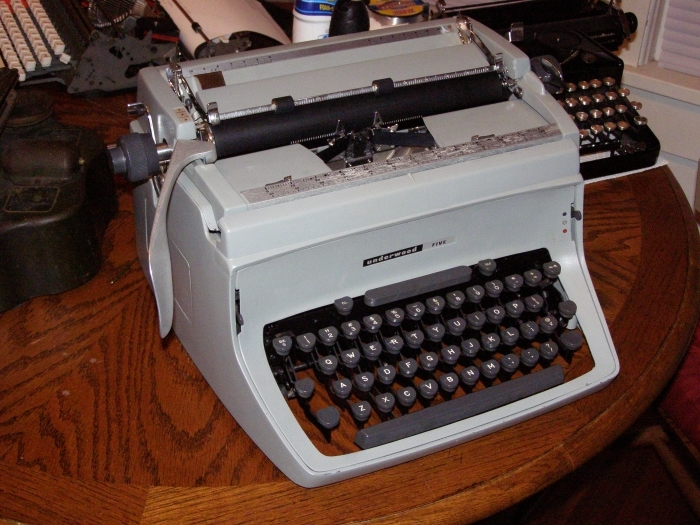 I worked in a pharmacy as a teenager and the pharmacist used an Underwood like this to type prescription bottle labels. It was very heavily used, but never needed repair. It had an painted aluminum case, not plastic. Are replacement parts available? if so, where? Yes, but from broken machines mostly. Sometimes from people who buy out old repair shops or people who still operate repair shops. Most of the time to get a part you need to find a donor machine. I learned to type on one of these Underwoods in 8th grade typing class, Indialantic Florida, 72-73 school year. I found one in good shape a couple of years ago. I just found one of these next to a dumpster. I'm trying to find the serial number, but no luck yet...any pointers? 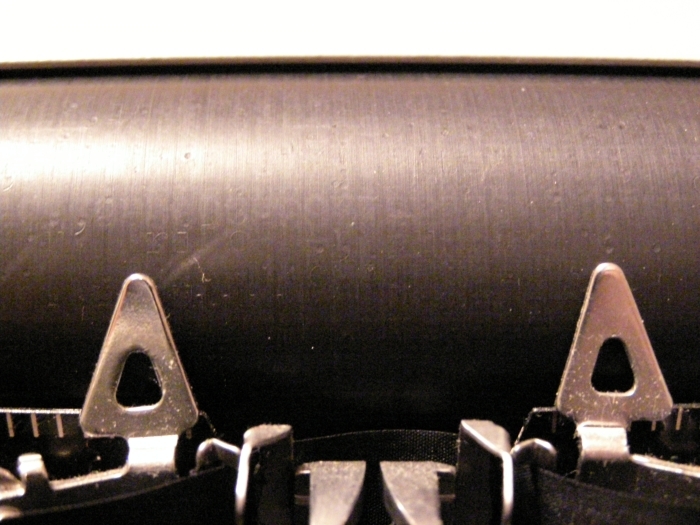 Move the carriage toward the left side of the typewriter, and there should be on the right a small silver tag with the number 11 (indicating the carriage length), and then a number following it. 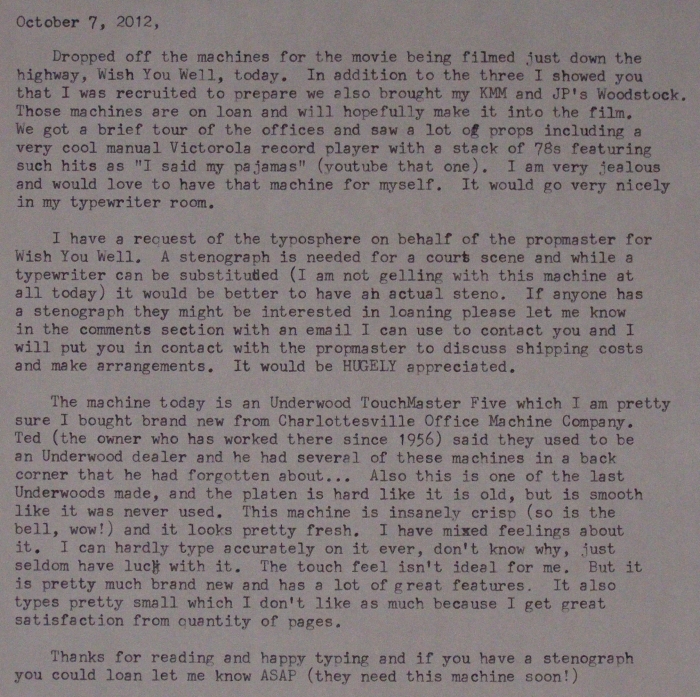 Go to Typewriter Serial Database and look up "Underwood." It will tell you.